More than 100 people attended a spook-tacular and fun-filled event at the latest Connected Communities centre. 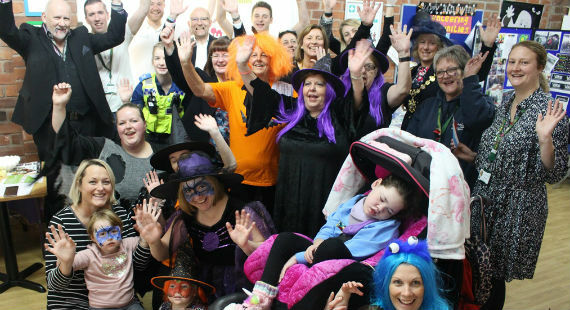 Ruby’s Fund, in Congleton, was packed with children and families at the end of October – all of whom came to join in the celebrations to recognise the popular venue as the 19th Connected Communities centre in Cheshire East. There was much Halloween fun with dressing up, face painting, dancing on the new sensory mat, games, food and fun. Councillor Liz Wardlaw, Cheshire East Council’s cabinet member for health, was joined by managing director of the Ruby’s Fund charity, Councillor Paul Bates, and the Mayor of Congleton, Suzie Akers-Smith, as operational lead and founder of Ruby’s Fund (and Ruby’s mother), Alison Parr, cut the ribbon. Connected Communities centres are where local community venues, including churches, village halls and community cafes, are given a grant by Cheshire East Council of up to £5,000 to help develop services, which are needed and requested locally. The council’s communities team gives ongoing support and guidance to the centres to ensure their continued success. Cllr Wardlaw said: “There are so many aspects to health and wellbeing and it’s fantastic to see so many children and their families and carers coming into the centre, having fun and enjoying the range of facilities and services on offer. We all need support at some time in our lives and it’s great that centres like Ruby’s Fund are there to help the local community. From coffee mornings, computer classes and line dancing, to learning a language, sharing a problem and support for stroke sufferers – there’s something for everyone. Every centre will also have a computer tablet connected to the Live Well community information website, helping residents to easily find out what is available in the area. By spring 2019, there should be 35 Connected Communities Centres open across Cheshire East. People can also telephone the council’s communities team on 01270 685880.